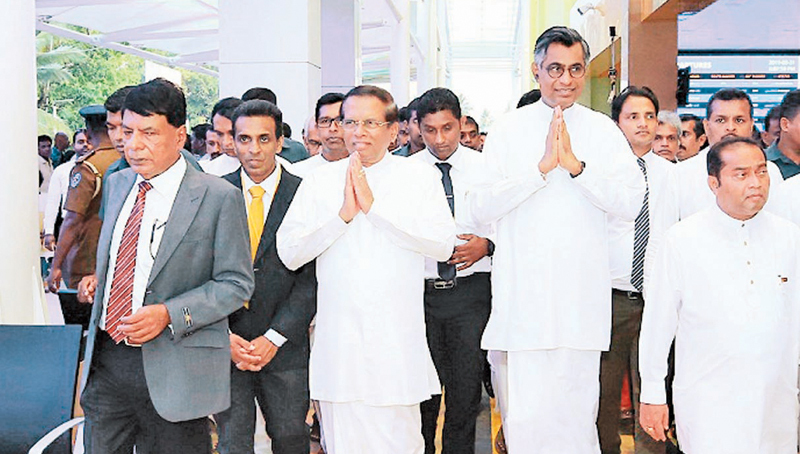 President Maithripala Sirisena and Megapolis and Western Development Minister Patali Champika Ranawaka greet those present inside the Makumbura Multimodal Centre yesterday. President Maithripala Sirisena pointed out that there is a collective responsibility with everyone to make an utmost contribution to develop the country. The President made these remarks after commissioning the Makumbura Multimodal Centre (MMC) the first ever Multimodal Centre of the country at Makumbura in the Kottawa area yesterday. “Everyone is duty bound to contribute to the development of the country as only the politicians cannot develop the country alone. Therefore people should notice that they are also responsible for the development of the country similar to politicians” he noted. President Sirisena noted that this government has taken many measures for the development of the country. People will not see the dividends of these development activities at once. It will take another two, three years to reap the dividends of these projects, the President added. The President said that management and maintenance of these public institutions such as Multimodal Centres are important. Both the public and public officers are equally responsible for maintaining these institutions well and efficiently. “Certain people had stolen some valuable instruments of one the institutions due to be opened like this one.When even the Treasury was robbed it is not a surprise that there are robbers everywhere,” he said. President Sirisena further urged the people to protect public wealth, public places such as this multimodal centre and also public offices without vandalising them. Road congestion causes severe social and economic issues and it is important to implement most modern modes of transportation methods such as Multimodal Centres. However the former governments did not pay enough attention on improving the public transport system, the President said. Speaking on the Sri Lankan railway system, the President said that it was among the poorest railway services in South Asia.